Ultrasound measurement of urethral mobility is an attractive approach to directly visualize bladder neck descent (BND) during stress. BND assessed by transperineal ultrasound appears to be associated with stress urinary incontinence (SUI) severity. This study evaluated the inter- and intra-observer reliability of ultrasound BND measurement and its correlation with clinical examination. We included 50 women from the multicenter randomized 3PN study (“Prenatal Perineal Prevention”). BND was measured by two operators either during pregnancy (at 20 weeks of gestation) or 2 months after delivery. Two measurements were taken by each operator. Intra-class coefficient correlations were used for analysis. 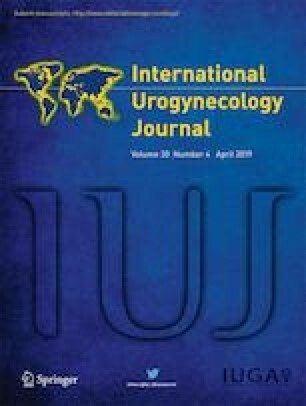 Urethral mobility was clinically assessed by measuring the point Aa of the POP-Q classification during maximum strain (Valsalva maneuver) with an empty bladder. Ultrasound analysis showed high intra-observer reliability in the overall population: intraclass correlation coefficients (ICC) = 0.75 (0.59–0.85) and 0.73 (0.55–0.84) for each operator. Intra-observer agreements were considered moderate to high in the post- and antepartum groups. Inter-observer agreements were moderate in the antepartum period [ICC = 0.58 (0.26–0.78) for the first measurement and 0.68 (0.42–0.84) for the second] but low in the postpartum period [ICC = 0.15 (0.10–0.41) and 0.21 (0.10–0.58)]. Correlations between ultrasound and clinical measurements were considered low to moderate (Spearman coefficient, rho = 0.34 and 0.50 for post- and antepartum periods, respectively). Inter-observer reliability of ultrasound urethral mobility measurements by the transperineal route is moderate antepartum and low postpartum. The correlation with point Aa is low to moderate.